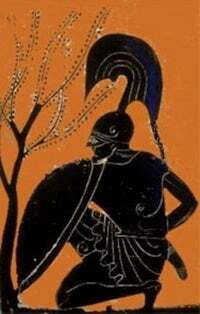 ... there's something we can call "polyheroism" in the Iliad. It's pretty much like a five-man group in WoW, or a six-man fellowship in LOTRO: Achilles is the DPS guy, Ajax is the tank, Odysseus is the rogue, etc. To enact a story about the meaning of excellence, you need to be able to compare heroes. Everyone loved Achilles, just like everyone loves a good, well specced champion. But some people like Odysseus better than Diomedes, just as some people would rather have a burglar in their party than a second DPS class. I'm not saying that RPG classes have the depth of epic characters (though you'd be surprised by how little depth epic characters actually have). I'm saying that one important function of characters in the Iliad and in MMOGs is to get us to think about how different versions of excellence relate to one another. Gear isn't quite the fundamental, all-pervasive mechanic in the Iliad as it is in MMOGs. But in its own way, it's actually much more important in epic tradition.